We begin with Ben walking around New York in the rain, an obvious but still appropriate metaphor for how he’s feeling. He’s giving himself crap about how he’s a monster and says he’ll never be human again. (It’s not mentioned how, in the last issue, Ben felt rejected when Alicia gave so much attention to the Silver Surfer, but that event certainly led to his current mood.) Ben meets a mysterious bald man out on the street, who says he knows what it’s like to be alone. The man invites Ben into his apartment, and they chat over coffee (no, really). 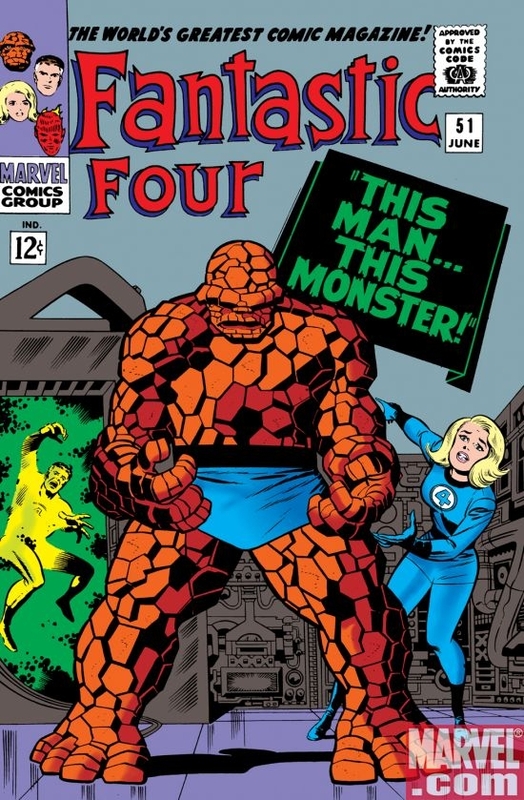 The coffee is drugged, and Ben passes out, allowing the man to monologue about how he is a scientist and how he wants to destroy the Fantastic Four. 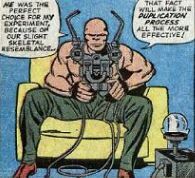 Using a “duplication apparatus,” the man transforms himself into the Thing, which also turns Ben back to human. 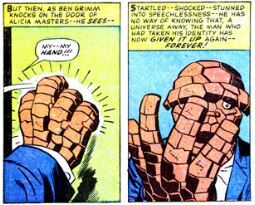 Leaving the still-unconscious Ben behind, the man leaves with the intent of infiltrating FF headquarters. While the technobabble sinks in, we cut to Metro College, where Johnny is enjoying life as big man on campus, although the literal big man is his musclebound Native American friend Wyatt Wingfoot. The two of them run afoul of jerkass star quarterback Whitey Mullins, who wants to pick a fight with Johnny. 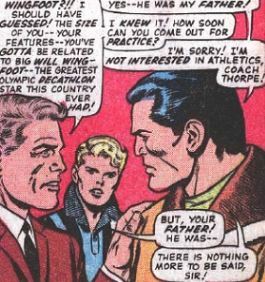 Before Johnny can flame on, the world-weary Coach Thorpe breaks them up. Thorne then recognizes Wyatt, expositing that Wyatt’s father is the greatest Olympic decathlon runner in U.S. history. Thorpe then tells his wife that he’ll stop at nothing to get Wyatt to join football team, looking kind of evil as he says it. Back at HQ, Sue begs Reed not to enter the cube. “I have a premonition of disaster!” she says. (Since when does she have this power?) Reed argues that subspace must be investigated, for the good of all mankind. The imposter Thing is impressed, realizing that Reed isn’t just all talk. 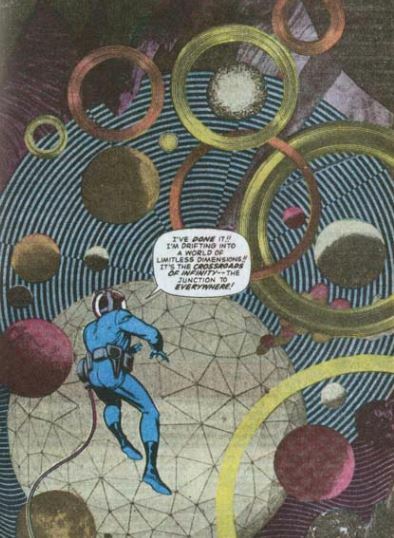 We get two pages of gorgeous Jack Kirby artwork as Reed finds himself in what he calls “the crossroads of infinity.” (So much for this being a smaller, non-cosmic tale.) Then it gets dangerous, as these things so often do, as Reed discovers that matter in subspace is negative, and cannot come in contact with the positive matter on Earth. Checking in with the real Ben, he’s about to knock on Alicia’s door, impressing her with his new human self. Just as he knocks, he transforms back into the monster. He runs off before she comes to the door. (Apparently, they’re considered broken up/separated by this point.) He returns to headquarters, the truth is sorted out, and the imposter gets his due when Reed says he died as a hero. 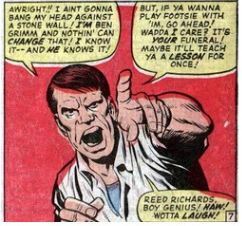 Unstable molecule/Fade out/Clobberin’ time/Flame on: This is interesting; throughout the entire issue, the characters do not once use their super powers! Trivia time: Although not called “the Negative Zone,” this is indeed the Negative Zone’s first appearance. It’s always been one of my favorite aspects of FF lore, that there’s this doorway to a mysterious, dangerous universe right there inside their home. The villain’s name is not revealed in this issue. I’ve searched and searched to see if he ever returned in later stories, but I haven’t come across any. Anybody know if he ever came back? Discussion of Wyatt Wingfoot’s father is abruptly cut off, reestablishing that there might be something mysterious about Wyatt. Fantastic or Frightful: What a great issue. Our mystery villain’s change of heart makes for some nice drama, as does Ben’s depression. 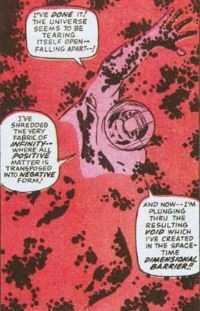 The Negative Zone stuff is really exciting as well – gotta love the Kirby dots! Next week: Wakanda is lovely in the springtime.